I remember my very first XBRL meeting. It was 2003, and there were 25 - 40 people in the room. I distinctly remember all the benefits that XBRL was (is) going to bring. I remember a wonderful slide that had two time bars, one above the other - the "before XBRL" and "after XBRL" bars. Each bar was broken into segments, with the time required by each party identified - the Company (reporting), the Auditor, the Bank, the Analyst and the Regulator. The bottom bar showed all segments shrinking, except - a very important 'except' - the Company segment. It looked something like this (reconstructed from faulty memory). XBRL will increase transparency, and will deliver massive benefits to regulators and investors. As it becomes more widely entrenched and systems are built that will exploit the power of tagged information for credit risk, the banking community will take up XBRL and use it widely. This will benefit businesses by improving access to credit at rates commensurate with their financial health and potential. As systems integrate XBRL into the 'front end', operational efficiencies will be achieved by companies. This they will happily pay for. Unfortunately we also know that Detailed Tagging is going to impose significant cost on businesses, at little or no tangible benefit to the companies that are required to pay for their reports to be detail tagged. An issue I've had from my very first XBRL meeting has been a Big-4/Consultant agenda of "let them spend (on our consultants), while we tell the world how good this will be for them". That has been the message from all the Big-4. At that time I was at Grant Thornton, a great firm. And a firm that was focused on the "middle market", not on the biggest companies. I had come to that meeting almost directly from a meeting with a nice little company ($50 million turnover) and watched how they managed every penny, looking at specific metrics, and providing the reporting that they needed to. They felt (and I quietly agreed) that the Audit required of them was a pure overhead, because they could not see the benefit to them - other than access to credit. So their audit was at the lowest price they could manage, and there were no frills. In fact, there were few frills in their offices, including the President's and the CFO's offices. Oh, and the CFO had three staff, total. I then went to the XBRL meeting, and listened to (name redacted) talk about how everyone downstream was going to get benefit - the banks, the regulators, the auditors, the investors... Everyone else was either reducing their risk, increasing their own effectiveness, or improving their return on investment. Everyone except the president of that $50million metal stamping business. And when I asked what would be the benefit to him, (name redacted) scowled and repeated the benefits to the banks, etc. I repeated my question, and that was the moment that (name redacted) and I became "friends". I am still, 8 years later, waiting for anyone to tell me how the president of that small metal stamping business is going to actually see, in bottom line terms, the benefits from the money that they are required to spend on XBRL. Certainly there will be benefits, but not from creating XBRL for external consumption. In fact, adding insult to injury, the same basic chart of can still be found here - XBRL - What are the Benefits. There is no date on the page. Maybe, just maybe, this is out of date and there is a new chart with benefits to the producer of the XBRL (the one who is paying). The (minimal) tagging requirement from the SEC seems reasonable to me - to enable the SEC to regulate the markets and reduce risk. Detailed tagging, simply put, provides benefit to a few downstream while imposing the costs on the producer of the information. So I'll be blunt - the Big-4 and the large companies that advocate Detailed Tagging are out of touch with the smaller filers. Businesses that are coming out of recession, and are happy to have survived, and are now looking to grow again. And they survived by watching every penny, taking the difficult decisions, sometimes very painful decisions. They don't waste money. If they are going to choose to spend it, they want to know what they're getting for that money. Not what someone else will get for their money, but what return they will get for their money. I could use the word "investment" - but really, we're talking about money. Limited money. So is anyone surprised that the $2500/year XBRL vendors are bringing in the clients? They shouldn't be surprised. The sad thing is that many of the purchasers at $2500/year are in for a nasty surprise when the discover the real level of effort on their part, and the very real danger of missing SEC deadlines for lack of resources. 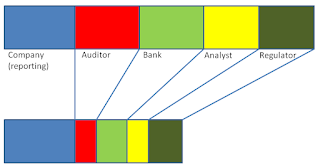 XBRL is complex, and expensive - either in external costs, internal costs, or a combination. Total costs will fall, but there is probably going to be some real pain along the way. For more information on XBRL offerings, visit us at www.raas-XBRL.com or pick up a copy of our 2011 XBRL Buyers Guide. Thank you for that. The MACPA is a wonderful example of what can be accomplished with limited resources. I was particularly pleased with PwC's contribution of Eric Cohen to assist with their project. Will PwC be making Eric available to all other smaller not for profits that wish to follow the MACPA path? Here's a way. Every smaller company that wants to directly access the private investment and credit markets while bypassing the universe of intermediaries -- data vendors, rating agents, investment bankers -- and have direct discussions can publish an SEC Exhibit 101 formatted data supplement package. There's no actual need to audit it either because any credit source should be going through an assessment in detail of it's own anyway. Why do it twice? So that eliminates even one more intermediary. This facilitate a new and efficient form of connectivity between SEC Registrants (or even the much larger universe of non-registered private entities) and investors, domestic and foreign. Naturally, as such counterparty information exchange methods continue to mature it will change value of services rendered proposition of the entire finance landscape. There may be some start-up work to do it but if 99% of the intermediate cost can be eliminated by it, there may be ROI in making use of an XML formatted data file after all. And after that how long before it becomes a standard output of even the most basic desktop bookeeping software package. Such development will at some point surely get the attention of larger companies as well. The very companies as you pointed out were slated in that chart to never see a cost savings benefit from xbrl but instead be perpertually burdened with an elevated cost of doing business rate. Ultimately, that is probably not a valid assumption for how things will work out. I agree generally with your comments. What we do agree on is that XBRL as an output format will become ubiquitous, and this will happen sooner than history should lead us to expect. My own guess is that within three years, it will be difficult to find a respectable accounting package that does not provide XBRL output as a standard feature. That will then begin to deliver the benefits to smaller filers, and indeed to all companies, especially those the provide audited financial statements to banks for lines of credit. The largest companies are already seeing benefit from XBRL (some) by integrating the XBRL production into their systems and work flow, and using technology to enable process time reductions and workload reductions. Unfortunately, for now that is being counterbalanced by the increased effort of detail tagging and the need for assurance over the XBRL (which is add back cost and time to the process). In summary, process improvement benefits are years away for smaller companies, while additional XBRL related costs are here today. I would like to add our perspective on this. While Eric did provide inspiration and direction, the actual work was all accomplished with an accounting student intern (Thomas Hood from Salisbury University and yes he is my son). Thomas had advanced computer background from high school and is a senior accounting major with two summers interning with a public accounting firm. At the XBRL US presentation we did, you can see he is clearly the one who did the work and understands it as well. He was able to tag our financials over the summer using Altova MapForce and Xwand from Fujitsu. We were able to successfully use XBRL to link our Association Management System to our Accounting System (MS Dynamix) and produce drill down financials, auto links to a KPI analysis package and improve internal financial reporting. Other unexpected benefits were audit reports and much easier analysis. We now hope to benchmark across several other state CPA societies to explore the comparability features of XBRL. Our takeaway is that this is powerful and not as hard as many seem to think. The detailed tagging once done is immediately useful with Excel and other packages.